By using the “CUSTOMIZE AND UPGRADE” section at the top right of the page, youcan choose which style of backup camera fits your needs and budget. 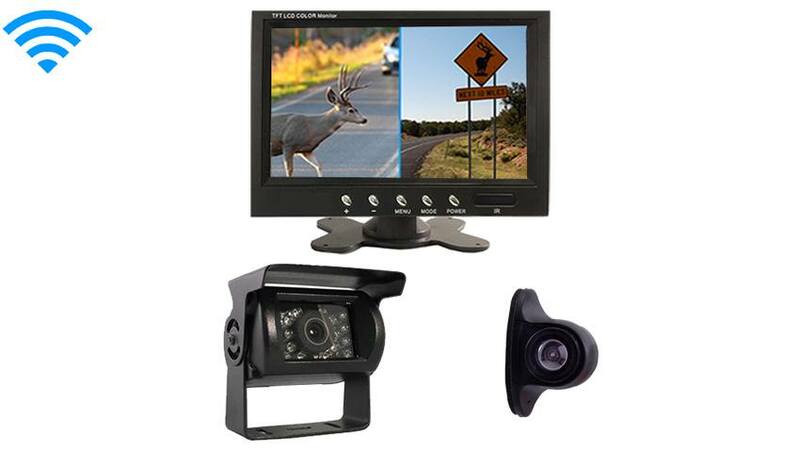 This system comes preconfigured with 2 cameras however, we have different styles for all kinds of uses. Change 1, both or none of the cameras in this system, choice is yours. Please use this guide to help you select which camera is best for you. The side camera has a 120° Degree viewable angle, its waterproof and has auto night vision. The side camera is perfect for any long RV or Bus. You can mount it on the side facing front or back any see everything in crystal clear quality. You need help parking? This is for you! You need help changing lanes on the freeway? This is a must! Unlike many other side cameras ours are also a compact size so you will not knock them off your RV in really tight spots FOR THOSE OF YOU WHO WANT MORE! You can also add a FRONTAL camera and a rear camera to make it a 4 camera system! The Heavy Duty Wireless RV Box backup camera Has a 120° Degree viewable angle, its waterproof and has auto night vision. The backup camera is one of the most durable we have, with incredible adjustability and night vision clarity. The RV Box backup camera has a metal sun shield visor to protect you from glare and pebbles. This is by far our toughest built backup camera, It has been regularly used in cars, vans, buses and even industrial sized caterpillar trucks, operated in the harsh oil sand of Canada. This backup camera can take a direct hit from a rock and it will still work like new. It has also been very popular with RVs, because its housing allows you to install the backup cameras on multiple sides of your RV. This backup camera is also a wireless backup camera so there is no need to run cables through your Car or RV. TadiBrothers only sells one type of wireless backup camera because its the ONLY one on the market that is reliable.This wireless camera has a 70ft range that can go through any vehicle.